Volvo machines ... chosen for the job. 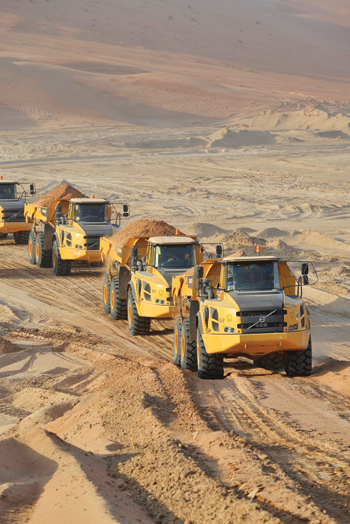 A FLEET of 95 Volvo machines has helped build the first-ever highway through the world’s largest and most barren desert – the Empty Quarter – establishing a vital connection between Saudi Arabia and Oman. The project is expected to have a major beneficial impact for people and businesses of the Arabian Peninsula neighbours, as the direct route through the desert will reduce journey times dramatically. In 2010, Al Rosan Contracting was one of the contractors hired to build the first ever road connecting the two locations, consisting of a 519-km-long highway and has been using Volvo Construction Equipment (Volvo CE) machines. The longest part of the road which Al Rosan Contracting was commissioned to build (256 km) comprises a single-lane carriageways and in sections where there are steep inclines, secondary lanes are added for trucks and slower-moving traffic. The Rub Al Khali desert, also known as The Empty Quarter or the ‘quarter of emptiness’, is spread over four Arab nations and covers 600,000 sq km. This includes Saudi Arabia, areas of Oman, the UAE, and Yemen. The desert itself is 1,000 km long by 500 km wide and surface elevation varies from 800 m in the southwest to sea level in the northeast. The terrain is covered with steep sand dunes with heights up to an incredible 250 m.
“The entire project was a challenge from day one whether it was the climatic conditions, topography of the area, the distance from the nearest inhabited city or availability of spare parts, logistics and services,” says Fahad Hazza Aba Alros, general manager of Al Rosan Contracting. “Trying to build a road on shifting sand dunes was always going to be difficult,” he adds. The project involved building sand bridges across salt flats and high rising dunes, so the selection of adaptable and reliable equipment was critical for this project, not least because of the aggressive environment, intense heat, sand and remoteness of the site. The construction of the 256-km road was completed in sections and involved gigantic amounts of sand ‘cut and fill’. 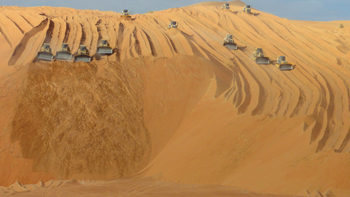 The sand transported to construct the bridge was 130 million cu m – the equivalent of 26 giant pyramids – and 12 million cu m of material was needed to protect the embankment of sand from wind and water. The equipment was ordered throughout several stages of the project, totalling 95 Volvo machines, including a range of articulated haulers, excavators and motor graders. As the project progressed, a lead excavation team tackled the dunes while aiding the excavation and building of the raised surface and foundations for the road. “The aim of this project was to directly connect two countries by road for the first time, making it easier for citizens to travel from the borders,” says Fayez Subbaheen, project manager at Al Rosan Contracting. Hundreds of drivers, excavator operators, technicians and auxiliary workers – almost 600 in total – were employed over the three-year project. They lived in self-contained camps strategically designed with facilities to support this unique development. The remote location, 1,000 km away from the Saudi capital Riyadh, presented Volvo’s service and maintenance teams with a demanding schedule. This was manifested by the extreme desert temperatures, reaching 50 deg C in the day and dropping to below 1 deg C at night. Every day the construction team worked 14-hour shifts excavating and depositing sand that was then compacted using naturally salty ground water. The time constraints of this project depended on the Volvo machines working relentlessly. Throughout the project, the Volvo equipment was put through tens of thousands of working hours with just very little machine downtime, which translates to an incredible availability. “We also monitored the equipment for reliability and conducting fluid analyses to check the contamination of engine oils – the results have all been an excellent ‘A’,” says a spokesman for Al Rosan. He attributes these results to the quality of Volvo CE’s filtration systems. “While we have generally had to change filters once a week with other equipment, Volvo’s engine air filtration system ensures that the primary filter does not allow fine sand to pass to the secondary filter,” he says. In addition, Volvo had also sent qualified trainers to train Al Rosan’s drivers, who were all new to Volvo machines. Headquartered in Riyadh, Al Rosan is a specialist in road construction with more than 35 years of experience behind it and with a Grade A classification from the Saudi Ministry of Transportation. It has completed hundreds of projects throughout Saudi Arabia and is one in the few companies in the kingdom with expertise and experience to take on projects such as the highway across the Empty Quarter. Established in 1976, the family-run company has branches in many Saudi cities including in Qassim, Tabuk, Rafha, Jouf, Turaif and at the Oman border. Volvo CE is a major international company developing, manufacturing and marketing equipment for construction and related industries. Volvo CE is part of the Volvo Group, the world’s largest manufacturer of diesel engines in the nine- to 18-litre category. The group is one of the world’s leading manufacturers of trucks, buses and construction equipment, drive systems for marine and industrial applications. It also provides complete solutions for financing and related services. 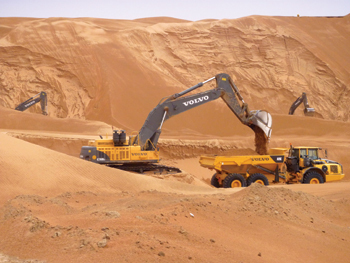 Saudi Arabia is a key market for Volvo CE, which is one of the world’s largest manufacturers of construction machines. The Sweden-based firm offers a wide range of products for the construction sector including skid steers, compact, backhoe and wheel loaders, compact, wheeled and crawler excavators, articulated haulers, motor graders, soil and asphalt compactors, pavers, milling machines, compact equipment and material handling equipment – the most popular in the kingdom being its excavators, wheel loaders and articulated haulers. The company is doing well in the roads and infrastructure as well as the energy sectors. Its major customers in Saudi Arabia range from multinational and large construction companies to small individual owners. Volvo’s pipe layers have also been well received in the market.